So here's the thing. Having passed up the opportunity to go to Old Trafford to watch The Arsenal in the FA Cup quarter final, I was beginning to suffer matchday withdrawal. Whereas normally I'd have been holed up in a boozer somewhere in Manchester city centre, I was watching Football Focus on the sofa dressed in grey marl, eating eggy bread and bacon with her of The Simon Amstell hair. A plan had been hatched the evening before over dinner, drinks, hash coffee and Weezer. And it was thus - at precisely a quarter to three (three!? What sort of time is this for a football match?) our motley crew of two Gooners, a West Ham-Tottenham hybrid, a part-time Bolton fan, Zach of the lamp and two glamour girls would meet at a designated point and travel onwards to Silverlands, the home of football in The High Peak, the ground of Buxton FC. 1. Yes, it's where the water comes from. 2. It has an opera house. 3. Mary Queen of Scots stayed here. Once. A long time ago. 4. 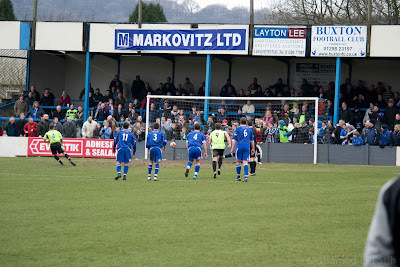 Silverlands is the highest football ground in England. And the coldest. 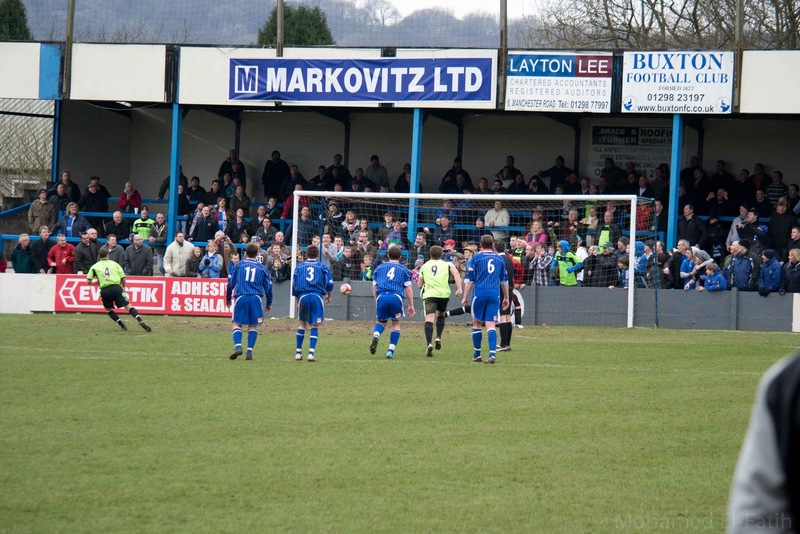 Halifax Town were top of the Evo-Stick Premier League (they still are), and Buxton ('The Bucks') were sitting eighteen points behind, albeit with a game in hand, in sixth place. Top of the table stuff, yes, and a crowd of 803 were there to watch it, some of whom wouldn't look out of place at The Mos Eisley Cantina. Eight and a half quid for adults and five and a half for kids (two fifty for ewoks, jawas and bounty hunters) ain't bad considering the fifty I'd have spent at Old Trafford. There's a clubhouse that looks and feels a bit like a working mens club, and a tea hut ('The Brasserie, don't you know) that runs out of meat pies, but not ropey burgers, hot dogs and Mars Bars. So, a quick drink (Stella, in a can) before the match started and we were out behind the goal for the first half. Just behind us stood the mighty Buxton Barmy Army aka The BBA. Average age twenty, numbering fifteen or so. 'You're going home in a Buxton Wheelie Bin' ringing in our ears. Scary stuff indeed. It isn't much of a match report, purely because I honestly haven't got a clue who most of the players were, so I'll have to keep it short and sweet. Buxton had the better of the first half with local legend Mark Reed going close (187 goals in 279 appearances) in the early exchanges, and set pieces looked to be the best chance of scoring a goal for both sides. This is the Evo-Stick league, you know. At half time it was nil-nil, on form what you would have expected. A little like Bolton at home to man Utd. The home side enjoying home advantage against the league leaders until the inevitable late winner from the visitors. Not so, chums. A penalty in the second half with twenty minutes to go from the most blatant of pushes by the Buxton centre half Gregg Anderson was dispatched with ease by Tom Baker of Doctor Who fame. One nil to the visitors, and it wasn't looking good, even the dogs, yes, dogs, were looking away. 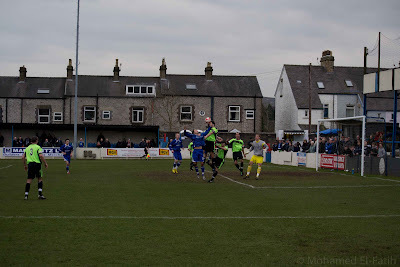 There was a kid up front making his debut for Buxton as a substitute, Sam Johnson. He looked just like the bloke that works in Sainsbury's up on t'marketplace. Hang on, it was the bloke that works in Sainsbury's. Sainsburys came on, and in a five minute spell with fifteen minutes to go, the little bugger helped himself to two goals and gave Buxton an unlikely win. The very same bloke (at least we're 99% sure it is) that I was buying a dodgy sandwich off only a few days before was my new hero. You won't see Clichy flogging sarnies down the Holloway Road, you know. Relaxing afterwards, watching The Arsenal limp out of the FA Cup (again), I was chatting with Mexican Les about the non-league experience. 'F*cking brilliant', he said. To the point, as ever. It was a great day out at a small club with a lot of strange looking fans. If you're up this way and there's a game on, get up there. Like most that go and watch the odd non-league game now and then it reminds you of why you started going to football in the first place, be it Silverlands, The Emirates, Anfield or Old Trafford. That is - to have a good day out with mates on the terraces, stand with who you want to stand with, and watch a proper game of football. Simple really, isn't it? It's FC United of Manchester for Buxton at home this Saturday. They were set up in 2005 by United fans objecting to the Glazer family take-over of their club, but not just that, they were fed up with changing kick off times at the behest of Sky, 'soulless all seater stadia full of 'new' supporters intent to sit back and watch rather than partake of the occasion, heavy handed stewarding and ridiculously priced tickets'. I'm no United fan, but good on them. Everything I used to love about the beautiful game is slowly being stripped away by our clubs, Sky, The Premier league, The FA, billionaire owners, and even that French tramp Michel Platini (who cheats at golf, just so you know), someone that you'd like to think would know better. The same time Buxton kick off this Saturday, The Arsenal will be kicking off against West Brom at The Hawthorns. I haven't got a ticket, so it's either a dodgy stream or Silverlands. I know where I'll be. What a brilliant blog. I put it immediately in the list of my favorites on my page. You can place the link on my listing? Thanks for writing this. Will link it on my own blog.